The spinal cord begins at the base of the brain and continues through the bony canal of the cervical (neck) and thoracic (chest) portions of the spine to end in the upper region of the lumbar (lower) spine as a bundle of individual nerve fibers. At any level the spinal cord carries the neural impulses to the regions of the body below (distal to) that level. In the upper cervical spine, the spinal cord contains fibers that transmit impulses to the arms, chest, and legs. The clinical syndrome that results from a disorder in the spinal cord that disrupts or interrupts the normal transmission of the neural signals is called a “myelopathy”. For anatomical reasons, cervical myelopathy may involve the arms and hands, legs, and bowel and bladder function. There are many causes of cervical myelopathy; anything that interrupts the normal flow of neural impulses through the spinal cord may cause a clinical myelopathy. Some of the causes are trauma, viral processes, inflammatory or autoimmune disorders, tumor, or degenerative processes including spondylosis and intervertebral disc herniation. It is the last group of causes that are of particular significance to the neurosurgeon or spinal surgeon. Cervical myelopathy secondary to degeneration is called “cervical spondylotic myelopathy” to indicate that spondylosis is the root cause of the syndrome. The spinal canal is an enclosed bony tube through which the spinal cord runs. There are generally a few millimeters of fluid-filled space surrounding the spinal cord, which helps to protect it from trauma and allows for the considerable flexibility of the neck. Some people, however, are born with a smaller-than-average spinal canal; this is called “congenital cervical spinal stenosis”. Stenosis is a general term for narrowing. The cervical spinal canal may become narrowed over time due to degenerative changes within the spine. Bone spurs (osteophytes), disc bulges, and thickened ligaments may develop and encroach on the spinal canal. In some cases, the space normally surrounding the spinal cord may be severely compromised and pressure on the spinal cord occurs. The symptoms of cervical myelopathy depend on the level(s) of the spinal cord that are involved and the pattern of the involvement. Symptoms may include: numbness of the hands, clumsiness of the hands, arm weakness, hand weakness, leg stiffness (“walking like a robot”), loss of balance, and urinary urgency. Neck pain may also be present but is frequently not a significant complaint. The timing of the appearance of symptoms and their progression is also highly variable from person to person. The rate of progression of an individual’s symptoms may change over time, with periods of relatively rapid change interspersed with periods of stability or minimal progression. Although the recent pace of symptomatic progression may serve as a rough guide for the near future, there is no certain way to predict the natural history of cervical spondylotic myelopathy in an individual. This image shows spondylosis with intervertebral disc herniation and bone spur formation. 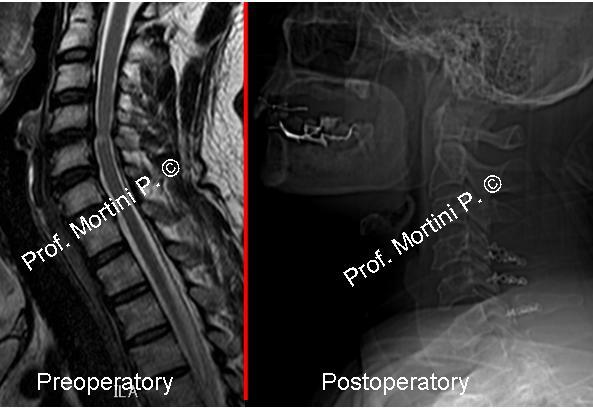 The clinical diagnosis of cervical spondylotic myelopathy can be difficult because of the multiple potential causes of similar symptoms and the variable presentations. Ultimately the diagnosis is usually made based on the patient’s history and examination and radiographic studies that confirm critical cervical stenosis with compression of the spinal cord. Post-myelography computed tomography (myelo-CT) or magnetic resonance imaging (MRI) may be used to obtained high-resolution images of the cervical spinal canal and the spinal cord. The presence of significant compromise of the spinal canal with pressure on the spinal cord in an appropriate location to explain a patient’s symptoms is generally sufficient to make the diagnosis of cervical spondylotic myelopathy. The key to the treatment of cervical spondylotic myelopathy is to remove the pressure from the spinal cord. The surgery is performed to prevent the progression of symptoms; clinical improvement may or may not occur. You will need to discuss your prognosis with your Neurosurgeon prior to making a decision to have surgery. Surgical procedures to decompress the spinal cord include approaches from the front of the neck (anterior cervical discectomy and fusion, anterior cervical corpectomy), from the back of the neck (cervical laminectomy, cervical laminectomy and fusion, cervical laminoplasty) and combined procedures in which both an anterior and a posterior approach are used. The exact procedure performed is based partly on the location of the stenosis and the overall alignment of the cervical spine, but many factors are considered in the decision.